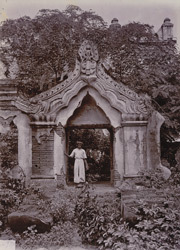 Photograph of the entrance gate of the Pitaka-taik (Royal Library) at Mandalay in Burma (Myanmar), from the Archaeological Survey of India Collections: Burma Circle, 1903-07. The photograph was taken by an unknown photographer in 1904 under the direction of Taw Sein Ko, the Superintendent of the Archaeological Survey of Burma at the time. Mandalay, in Upper Burma, was the last capital of the Burmese kings, founded in 1857 by King Mindon (reigned 1853-78). The site of the city was chosen in fulfilment of a Buddhist prophecy that a religious centre would be built at the foot of Mandalay Hill. The Pitaka-taik no longer exists but was one of seven structures built to mark the foundation and consecration of Mandalay as the new royal capital and stood near the hill close to the Kuthodaw Pagoda. Taw Sein Ko commented in his ‘Report on Archaeological Work in Burma for the year 1903-04’ (Rangoon, 1909): “The Pitakat Taik or Library is a masonry building with teak joists. Its restoration will cost about Rs. 7,000, but its architecture or historical associations do not appear to justify such expenditure.” This view shows the arched entrance gate to the library, with the library obscured by trees. The archway is crowned with a pediment featuring stucco decoration of makaras (mythical sea serpents), lions, and a celestial being from the Burmese pantheon of spirits. It is shown in a dilapidated state, with exposed brickwork where the stucco has fallen away.